Jubilee Bank Holiday bargains from Sevenoaks & Richer Sounds | What Hi-Fi? 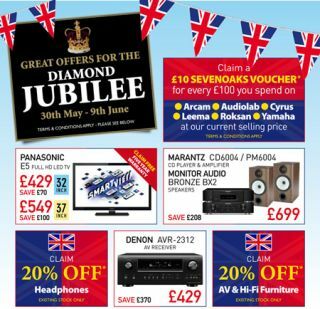 If you're not getting out the bunting and taking part in a street party this Jubilee weekend, then you might find some good bargains in your local hi-fi emporium. Sevenoaks Sound & Vision is offering 20% off headphones, hi-fi and AV furniture, interconnects/cables and in-ceiling speakers. Or you can claim a £10 Sevenoaks voucher for every £100 you spend on Arcam, Audiolab, Cyrus, Leema, Roksan and Yamaha kit at "current selling prices". There are savings of £208-£408 on selected CD/amp/speakers combos too, some great deals on micro systems with speakers and discounts on Panasonic's 32in (£429) and 37in (£549) E5 Full HD LCD/LED TVs. Check out the Sevenoaks website for all the latest offers. The 20% off and £10 voucher offers are available to in-store callers only, and not in conjunction with any other offer. Offers valid from May 30th to June 9th 2012. Head on over to Richer Sounds and you'll find more "Diamond Deals". There are discounts on a wide range of TVs, AV receivers, Blu-ray in a box systems, iPod docks, hi-fi, headphones and more until June 7th. We've spotted an LG 60in plasma TV for £900, a Sony BDP-S580 Blu-ray player for £99.95 and a Samsung SMT-S7800 Freesat+ 500GB PVR for £170. Whatever you do this Jubilee weekend, have a fantastic time!